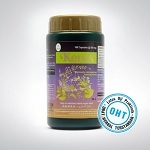 Kenis - 60 Capsules - Lowering levels in the blood glucosa. Reduce eating foods that contain a lot of starch and sugar. Only for people with diabetes who have established a doctor. During the use of this product, consult your doctor regularly. Orthosifonin and salt content of potassium is the main component that helps dissolution of uric acid, phosphate, and oxalate in the human body, especially in the bladder, gallbladder, and kidneys which can prevent the occurrence of kidney stones precipitate.